The latest Haier DC Inverter AC HSU-18HFAB is available now in the market of Pakistan with heating and cooling function. Its refrigerant is R410a with heating and cooling capacity is 18000BTU. 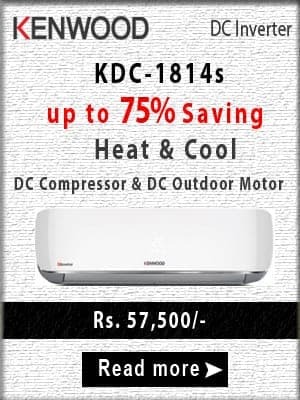 This air conditioner is equipped with DC inverter technology and gives you the best savings in the electricity bills. Haier self-clean function freezes the surface with moisture in the air and removes the dirt. One touch cleaning removes bacterial growth because it affects the health of human. It consumes 320 to 1667 watts of electricity and available in white color with price in Pakistan is Rs. 80000. This product is compatible with UPS inverter and its inverter plus PCB capable of smart monitoring between the municipal power supply and UPS power supply. The Haier company gives 1 Year parts and 3 years compressor warranty to its valuable consumers. Haier service centers is located all over Pakistan for warranty claims and complaints. The remote control consists of all features to control the functionality of this air conditioner. Some of its main settings are Temp control, Fan speed, Mode, Self clean, Timeretc.